Poor stuff at Catterick in a low quality auction race. Red Cell was an early debut for Eoghan O'Neill but looked a poor type in paddock review and ran moderately. He was well forward for that debut in fitness terms and didn't appeal as a type to improve much for time and development. A big part of a trainer's job is placing their horses in the right company though and Mr O'Neill has found a low level contest for him after a break. However, he has to give weight all round and Bahamian Babe showed at Southwell what a nippy & usable cheap one will do to him receiving weight. No obvious standout in the opposition and if at the sourse you would have a close look at Transformation to see if he might be a John Weymes debut winner. However, a race where a 'surprise' package would not be much of a surprise because the quality required to win is likely to be middling seller race range. With that in mind the rest of this preview will be a review of the 5f maiden at Newmarket on Sunday after the 1,000 Guineas. Only a small field but a Paddock Review a good one and worth spending some time on them. The following table gives the pre-race B2yoR profile ratings and the post race [Estimates] for the actual performances. At the headline level the profile might seem a bad one with the winner rating second bottom pre-race. That was based on the fact that it was an owner bred and the siblings had not been good. Added to that Marcus Tregoning has changed from being a notable FTO trainer a few years ago to having his 2yos much less prepared. 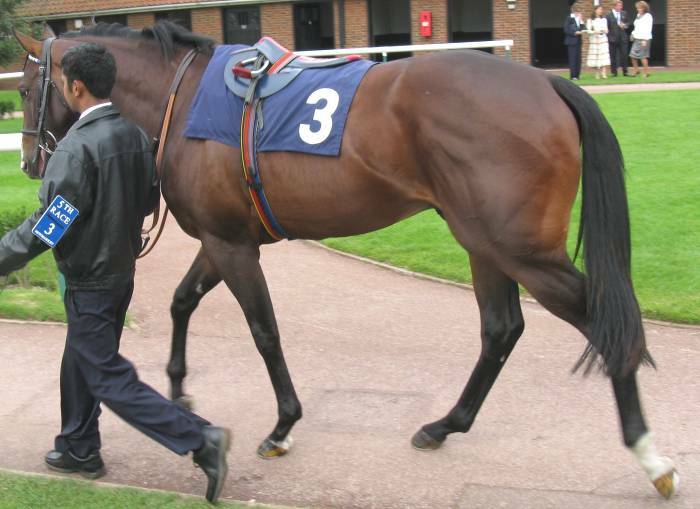 When B2yoR began in 2005 Tregoning debut runners at major courses often featured at the top of the profiles but ran in the 3rd+ range depending upon ability. 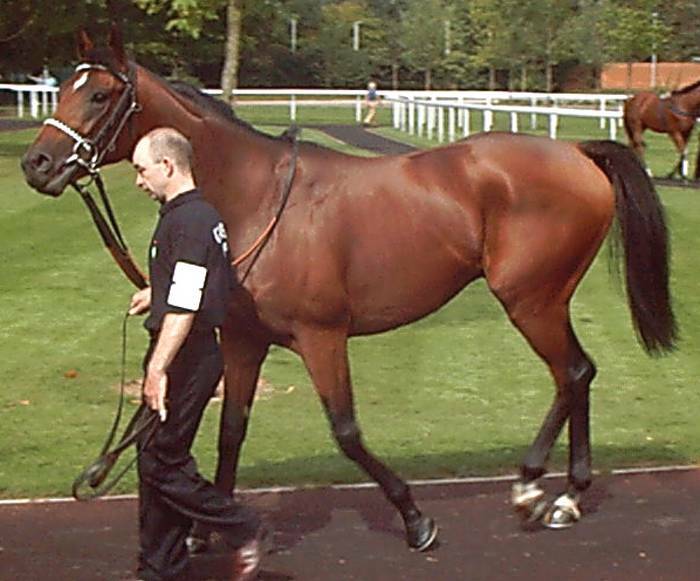 One clue that Finjaan might be better than just a middling 'owner bred' type was the early debut. If he was just middling then why run him in early May and why at Newmarket when you could hide him away at a lesser course. Putting Finjaan to one side for a moment the Profile stands up pretty well for the other horses. The overall level is a bit lower because the pace wasn't strong and the time just ordinary into a medium headwind. Heliodor ran a bit flat and underperformed and his performance is made 'worse' because he ran up the stands' rail which had been an advantage throughout the two day meeting. Natagora's jockey had taken her across to that rail to set the pace from a draw in the middle of the track to make the point. Jazacosta underperformed but looked less of a 5f type than many of the field and showed the most inexperience. 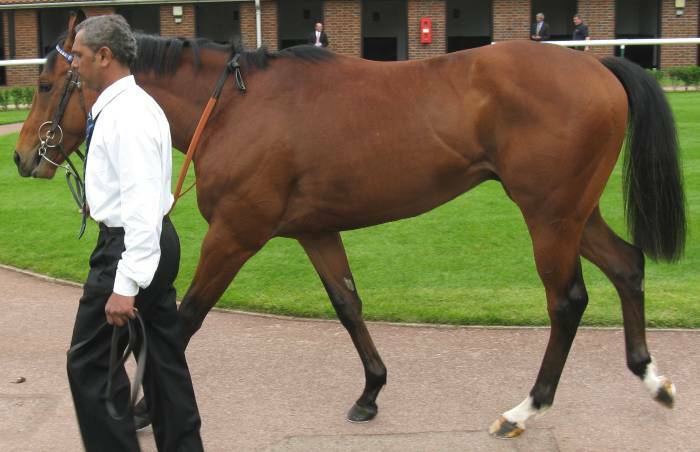 Let's go through the runners pretty much as they appeared in the pre-Parade ring and see how the Paddock Review adjusted the 'Profile' thinking. To begin with Ouqba who immediately answered a question that had been niggling away. 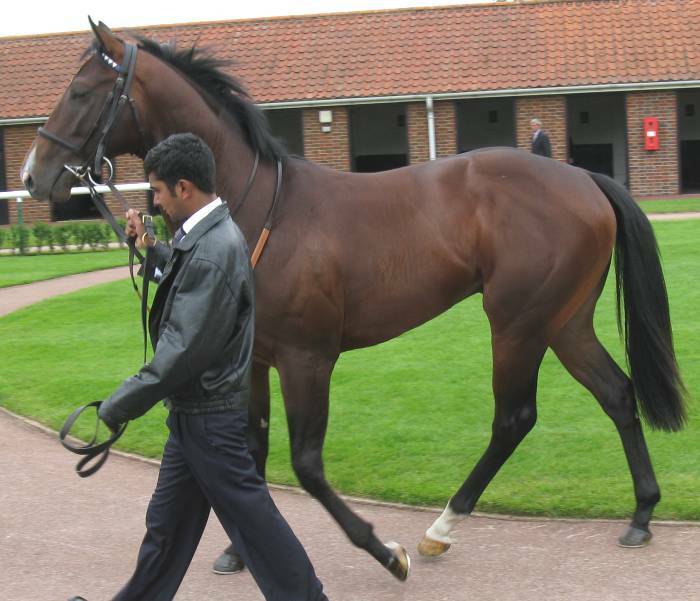 If Brenin Taran & Rayvin Mad are below average size why did they look a solid size on TV pictures in the later stages of the Newmarket Conditions race that Ouqba ran in? Why did Art Connoisseur look big in context when you know he is just a medium size but strongly built? Look at this Picture of Ouqba and you should realise that most of that field weren't that big. Your reaction to seeing him is probably that he's on the small side on looks a ready 2yo lacking scope. A quality one within what there is of him but the alarm bells are ringing, not deafeningly but there. The same trainer ran the very expensive Laith for the same owner in this race in 2005 and he finished 4th just behind George Washington. He was another small but well built one and struggled to win his maiden before finding any higher level races too much for him. He's now struggling to compete in bottom grade racing and not looking 'big' even in the context of those fields. Ouqba was the best prepared and most forward in terms of fitness and coat condition of all the runners in the field. That, added to the fact he had run before and shown a solid level of ability (although in a race that is clearly nothing like the exalted rating the Racing Post gave it afterwards) meant that you think he might just get away with winning today but he doesn't look one to follow into higher grade. At 5/4 favourite he's now looking skinny value on what you can see in front of you and time to look for something better, and bigger. Simon Callaghan has made a solid start since taking over from his dad and Cool Art (Picture) is his first 2yo runner. He's taller than Ouqba but a bit narrow behind. He's relatively mentally immature on the day, not forward in his coat and looks to need to fill out and tighten up in the muscle department. A good type but not ready enough today although, unlike Ouqba, with a good amount of scope to develop as the season progresses. 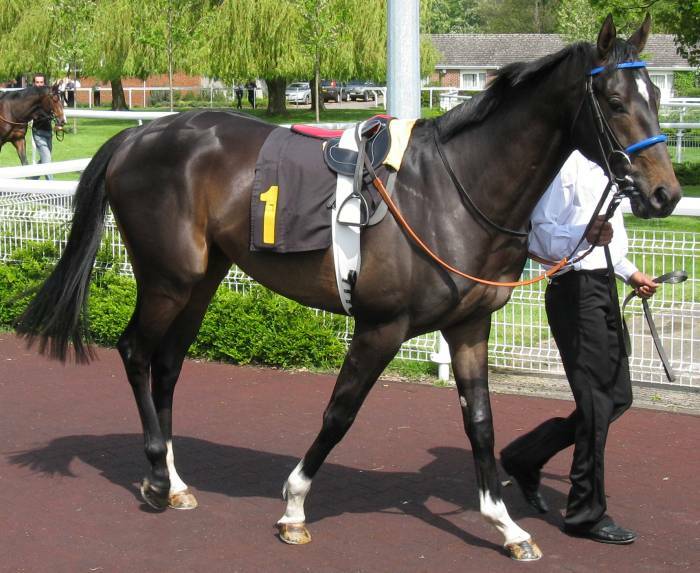 A 'Not Today' but a certain maiden winner when he's 'there' and could develop further. Try comparing him to the smaller and less powerful Elusive Ronnie (Picture), another son of new sire One Cool Cat, who was Mr Callaghan's second juvenile runner a day later at Kempton. The next one to be seen is Paul Cole's Desire To Excel. The trainer has been turning out horses looking shinier and fitter than practically any other trainer since the start of the turf season and many of his 2yos can show some spark and life. This one isn't like this and is much more laid back and lacking the shine (Picture). However, he's a classic compact, very deep bodied and powerful 'barrel' of a sprinter and moves well with it. 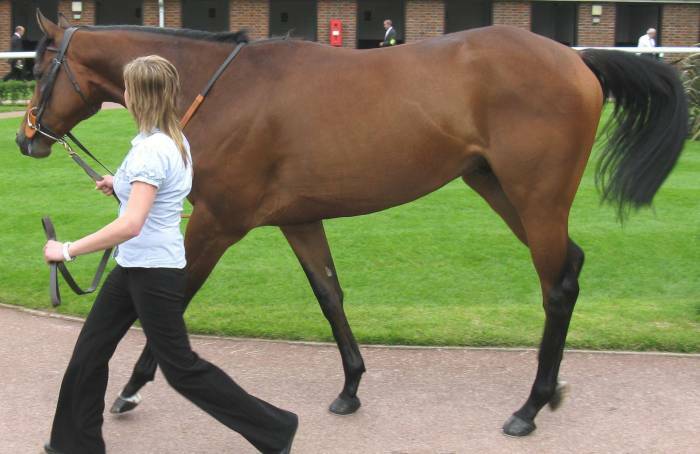 Try looking at this Picture of useful 2yo Red Alert Day from 2007 to see a similar model. He is apparently pretty lazy at home and that's partly why he doesn't look as tuned and polished as many a Cole runner. A solid run in third and easy to believe he's a better type who will probably end up in 6f Group races in later season. It's often a good idea for Paddock Reviewers not to read 'Stable Tours' and the like because the activity depends upon the person having confidence in their own opinion. As soon as you start trying to factor in external viewpoints problems start to creep in. In the Hannon 'Stable Tour' recently he said that Heliodor was likely to be his 'Coventry' horse and the fact he ran in this maiden suggested he was highly ranked. 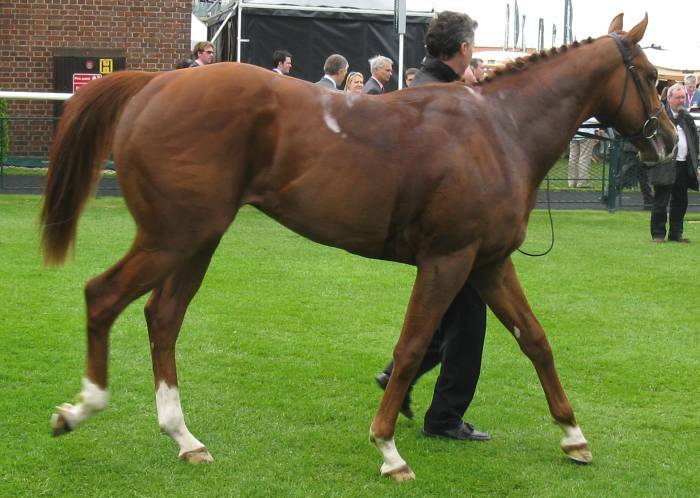 He's a classic Hannon, deep chested, 'build' 2yo (Picture). A similar idea to Desire To Excel. His attitude on the day could be classed as laid-back or a bit sloppy and immature depending upon your call. The Hannon 2yos tend to be more at the 'sheep' end but even so Heliodor didn't look to be at the top of his physical cycle on the day. As covered above he ran an 'ok' but flat race and you have to think he's better than he showed. So, you seen some of the others and Ouqba is still hanging on to his tenuous position as the best combination of type and readiness for today although you suspect that Cool Art, Desire To Excel and probably Heliodor will all be rated more highly by season's end. And then, hello, who's that. 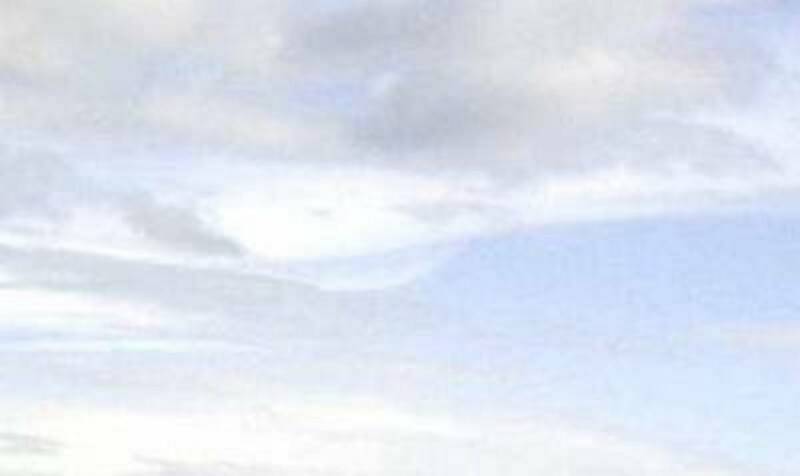 After all that laid backness and lack of shine see what your reaction to this one pushing itself into view might have been (Picture). A bit wild and on his toes but the tallest of the group and with a let-me-at-them attitude. A bit light through the body but very powerful in both the front and hindquarters. He's got a somewhat upright and gwaky neck that is not unusual in his sire's offspring (Royal Applause) and hasn't stopped Third Set (for example) from getting pretty near to the top. You look at him some more and try to convince yourself he has enough power through the body to be as good as he looks. This Picture shows him when he'd settled down a bit and wasn't up on his toes and dispels any lack of strength questions. The Profile has to be mentally updated with the thought that a mistake has been made. 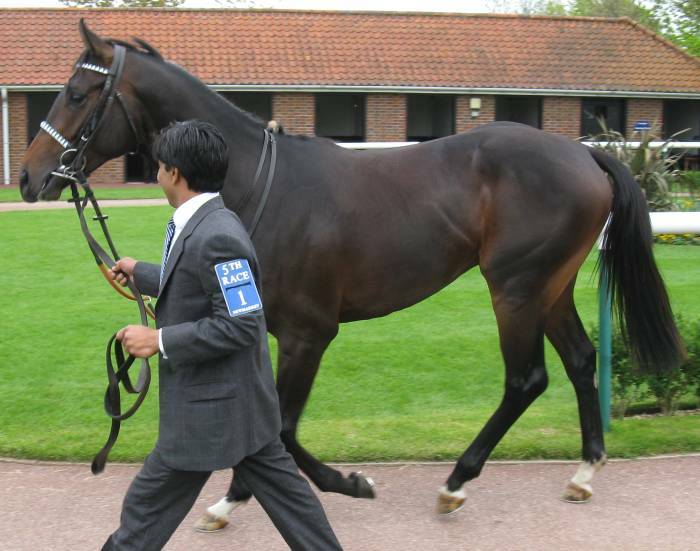 Tregoning really wouldn't be running a Hamdan owner bred this early at Newmarket because he was average. As one Paddock Reviewer said having seen him - "..if this thing knows enough to keep in the race he's going to be all sorts of trouble for [the much smaller] Ouqba in the final furlong..". At 5/4 for Ouqba and 10/1 for Finjaan the disparity in SP is too much given the interplay between raw ability and preparedness visible. Finjaan wins well and the trainer gave the impression afterwards that he hadn't done much with him but wanted to run him because of the ability he had shown. Hamdan's retained jockey was on Ouqba for his father and another example of how difficult his job is to choose between the Hamdan runners. Anyway, a horse to take very seriously because he did seem to win comfortably on raw ability and can improve a lot for increased mental maturity. He has the physical scope to improve and compete at Group level as well. The other two in the field were Amanda Perrett's Jazacosta and the 3,000gns purchase You Avin A Laugh for Chris Dwyer. 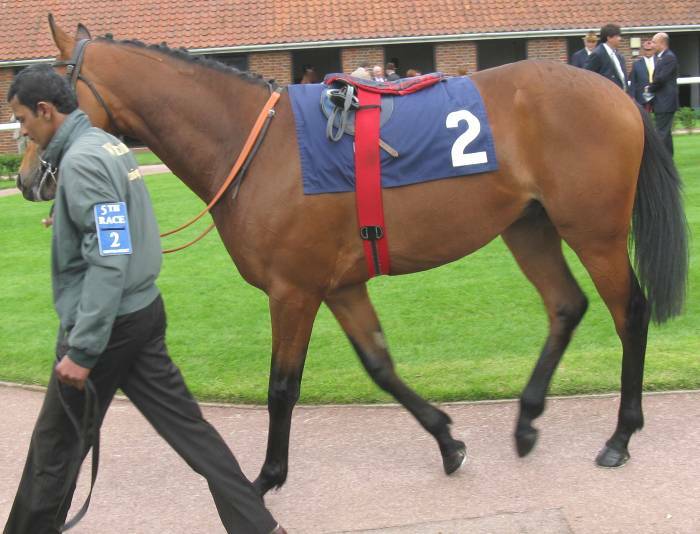 Having the second of those in the pre-parade ring with the other 6 was really useful. In Paddock Review you try to judge the horses against an absolute scale but, as humans we find it easier to judge relative quantities. Try thinking about that old school experiment putting one hand into hot water and the other into ice water and then removing both and puttin gthem both into a bowl of tepid water - the feeling your brain reports is all relative. You Avin A Laugh (Picture) just looks out of place and different against the other six. Like an 11 year old boy in with a lot of 18 year old rugby players. But, you can think back to places like Bath and picture You Avin A Laugh in the seller field and not looking out of place. Put him next to Finjaan and anyone ought to be able to right down 3-5 major differences between the two without resorting to horsey jargon once. Jazacosta (Picture) was another likeable type but the least mentally with it on the day. He's a different idea to the barrel chested ones in the field being taller and a bit rangier. Probably not a 5f type and better at 6-7f. But another good type in a good field and ought to rate OR90+ later in the year. 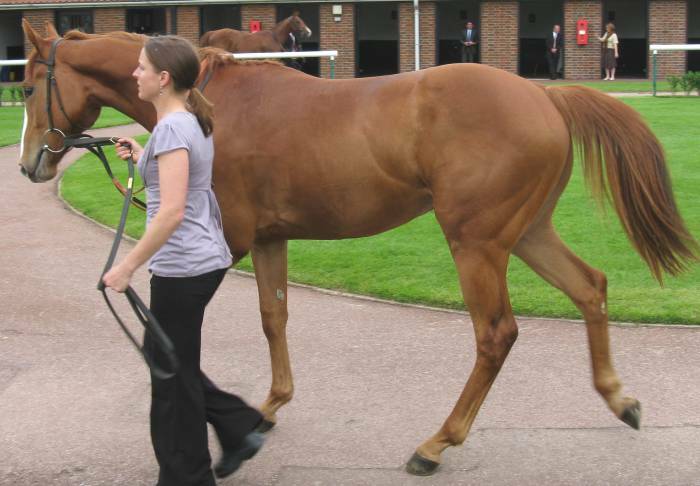 To round this piece off try now looking at the picture of Red Cell in the Catterick Virtual Paddock below. Where does he fit in the spectrum of You Avin A Laught through Ouqba to Finjaan?